In a time when we compulsively post our lives online, it can be easy to ignore logic. The feds say it’s dangerous to step out of moving cars for a viral dance challenge? Who cares. Road rash is worth the likes and shares. Netflix says to stop doing tasks, including driving, blindfolded for another viral challenge? Who cares. Likes and shares. That’s how it all starts. The Associated Press reports that the driver, whose name likely wasn’t made public because she’s 17, drifted into oncoming traffic and hit another car after covering her eyes. There weren’t many details on the crash other than that no one was hurt, but the AP reports that Layton police Lt. Travis Lyman gave “a warning he never thought he’d have to” after: Don’t drive while blindfolded. 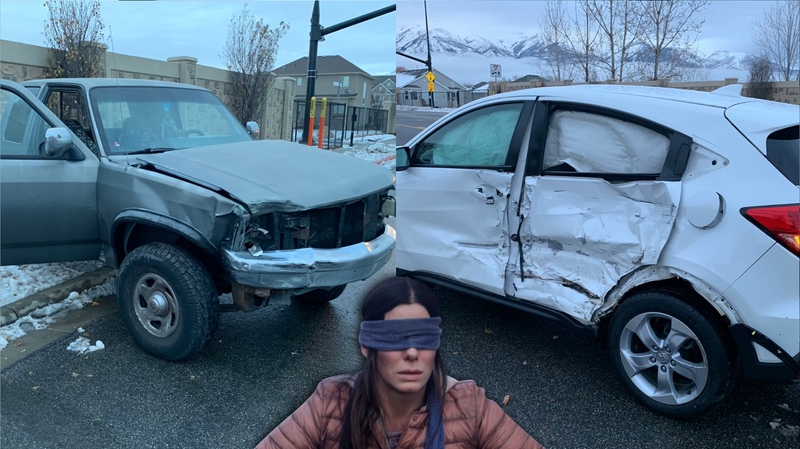 The challenge that inspired the crash spurred from Netflix’s new movie, Bird Box, which broke Netflix viewership records and became a huge meme online. The movie basically revolves around an invisible-to-the-viewer monster that, when seen, causes most people in the movie to kill themselves, meaning what’s left of the human race has to do things blindfolded in order to avoid it. Because a future where the remaining members of the human race have to do things blindfolded in order to dodge invisible monsters is completely plausible, people started filming themselves trying it out and posting the videos online. Perhaps inspired by the scene where a group drives a car at a crawl using its navigation system and safety sensors, on a road that was empty aside from a bunch of dead bodies, this teenager in Utah decided to cover her eyes while driving on a road that wasn’t empty and had plenty of other living, breathing humans around to potentially get hurt by the stunt. It’s a good thing no one did. The best iteration of this challenge will come when we all decide to figuratively blindfold ourselves from anything related to it, since we’re all vicariously losing IQ points—and potentially getting wrecked into by blindfolded drivers trying to prove their readiness for the monster apocalypse—by the second.